Welcome Week Leaders are student leaders here on campus whose goals are to ease the transition of incoming students to Sam Houston State University. They do this by promoting and taking part in Welcome Week events, encouraging students to engage, involve, and connect with fellow Bearkats and fostering Bearkat spirit. 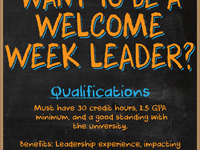 Interested students must have 30 credit hours, 2.5 GPA minimum, and be in good standing with the university.